After a week of our 50% off All Business Books sale, (use promo code BUSINESS), there has been a definite trend going. The top TWO most popular business books, followed closely by a third, are not at all a surprise to us, as these business books have always been super sellers for us. 1. Sewing Machine Repair As A Home Business — Sewing machine repair is one of the fastest growing professions in the world today! More than ever before, a profitable home business is where people are making fortunes. Job security in America has ended. Build your own security right in your own home! The average home business now earns over $50,000 a year, and growing. You only get one whack at life. Why not build your own home business that gives YOU freedom, security, prosperity and control of your life? Do you love sewing? Do you need a little extra money? Or a LOT of extra money? Would you like to stay home with the children instead of working a 9 to 5 job? Would you like to be in control of your own time? Does financial independence sound exciting to you? How about a new car? Would you like to take a “real” vacation this year? Clothing alterations could be your answer! A lifetime of success can be yours simply by turning your sewing abilities in a profit making direction. Your success is closer than you may think! There are people everywhere in NEED of the service you can provide! Who would be your customers? Teachers, secretaries, doctors, dentists, friends, neighbors, sales people – nearly EVERYONE in your town would be a potential customer. We’ll show you how to contact them and how to get them to refer you to all of their friends and co-workers. Turning your sewing hobby into a money making business can be done with VERY LITTLE money up front. In fact, we’ll show you how to get started with NO up-front money! We’ve even included a whole NEW section on special services YOU can provide, that no one else in town has even thought of! You’ll be the ONLY one offering these services, and your excited and happy customers will be back on a regular basis, and they’ll be telling their friends about your work! “How To Start and Operate A Profitable Clothing Alteration Business” is a COMPLETE MANUAL for your part time or full time alterations business. Sewing for plus size and overweight children is one of the most needed and practical professions in the world today. Never before have the money making opportunities been so great as in this field. Take a look around you and see how many children there are who aren’t “average” size and wouldn’t be able to wear clothing “off the rack” or fit into a pattern they’ve bought at the store. Look how the clothes fit that they are wearing. Are they tight and popping at the seams; or are they loose and hanging at the shoulders and too long in the sleeves, etc? Most people, including those who sew, have no idea how to alter store bought patterns to fit the plus size, overweight children properly, and for sure wouldn’t know how to use the child’s own personal measurements to make a clothing pattern that would actually fit them. This is where YOUR sewing experience comes in! A lifetime of success can be yours simply by directing your sewing abilities into a profit making direction. Your success is closer than you may think! Sewing for Plus Size Children is a wide open field, with literally no competition. Those who learn how to fit overweight boys and girls will have a never ending supply of potential customers. If you already have a sewing machine you can turn your sewing hobby into an extremely profitable money making business with very little or no up front money! There are other home business manuals, in addition to the three mentioned above. Depending on what your interests are and the type of hobbies you do will determine the best fit for you. Any way you look at it, this is the best time to get started in your own home business — and at 50% OFF, you just can’t get a better deal. The 50% off sale (using promo code business) is good only through September 8, so why not check it out while you’re thinking about it? You’ll be glad you did!! How Business Books Jumpstart Your Home Business! Start Your Own Business And SAVE 50% On All Business Books! Start A Business In THIS Economy??? School has started so this is the perfect time to start your own business with a 50% discount on every downloadable business book at http://SewWithSarah.com by using the promo code BUSINESS from now through September 8th. Are you in need of a little extra money or a lot of extra money for bills, that special vacation or just to have some extra cash on hand for the upcoming Holiday Season? From August 25th to September 8th, you can get a whopping 50% discount on any or all of our downloadable business books. Use the code BUSINESS to get the discount. Don’t wait – this sale is only good for 2 weeks, so get your books immediately and get on the road to earning the extra money you want! 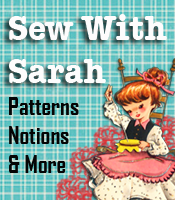 Hurry on over to http://SewWithSarah.com and start your shopping spree! Each person has different thoughts and ideas about what we want to sell online. I am a pattern maker – I simply love to come up with new ideas, then follow through with making a sewing pattern or craft pattern for the item. Others would prefer to actually MAKE the items, then sell the products. Whether it be sewing, crafting, knitting, crochet or whatever skills they have, it’s the process of making these special items that excites them. Regardless of whether you make sewing and craft patterns or actually make the products, there is a need to know WHERE we can go online to sell our stuff. There are many places online where you can sell your wares, and I want to cover a few of them here. Some you are probably familiar with, but others may be new to you. I’d suggest you check them out to see if they would be a good match for your products. In addition to being a place to sell your items, most of the websites also have forums, “community”, and/or blogs that you can participate in. Craftsy is probably one of the most popular sites to take classes as well as sell your patterns. They have a wide variety of categories that could be a great match for your patterns. In addition to selling your patterns, if you can make “kits” to go with your pattern – you package up the pattern and materials to make the pattern – there is a big category for these items. One of the best things is that Craftsy has no listing fees, no fees for selling your items, AND you get 100% of the profit from your sales. You set up your own “store” and add as many patterns as you choose. You will need a paypal account, as the purchase amount goes directly there as soon as a sale is made. Craftsy is a well-known name in the industry because of its diverse product offerings in multiple hobbies. You Can Make This is a place where you can share your expertise and make money doing it. This site is for patterns of all types – jewelry, sewing patterns, stitchery, crochet, craft and hobbies. There is a 4 step process to getting your patterns online at this site. You will need to register with them as a potential seller, provide a little information about yourself, then fill out and fax back to them the vendor agreement and W9 form. They will look over the information and get back to you within 5 days. After hearing back from them you will be able to submit your product idea to them as well as other information they require. They will then review your idea, and if approved, you will go through the final steps to get your pattern online. I have not submitted any products to them, but it appears that you may have to get each product idea approved in advance before adding it to the site. You Can Make This collects payments of all items sold, and you get paid 50% of the sales price and are paid once a month. DIY-Crush is a website where you can sell just about any type of pattern you make – from embroidery to cross stitch to craft and sewing patterns and everything in between. You are fully in charge of listing the descriptions, pictures and uploading your patterns. There are no listing fees, however DIY Crush does take out 45% of the sales price of each item. They have an instant payment feature that lets you receive your funds immediately to your Pay Pal account when a pattern is sold – you don’t have to wait until the end of the month. ETSY is probably the best known place to buy and sell handmade PRODUCTS. Their rule is that it has to be either handmade or vintage (20 years old or older). Etsy is a vibrant community of buyers and creative businesses. There are no membership fees with Etsy. They do charge $0.20 to list an item for 4 months, or until it sells. If it doesn’t sell within that time frame, you have the option of re-listing the product for another $0.20 or just keep it out of your store. Once you sell an item, Etsy collects a 3.5% fee on the sale price. When someone buys your item, they pay you through Etsy (the money goes straight to you), and you then ship the product to the customer. ArtFire has been around since 2008 and has a ton of categories for both hand made products, such as clothing, jewelry, art, beading, and woodcraft items to sewing and craft patterns of all types. There are no listing fees, however there is a monthly fee for your store. A “basic” store costs $12.95 per month and you get unlimited listings in the store. They do have several other ranges in price for a store, graduating up to $20 per month for a “Pro Seller” account. The Pro Seller account has extra features, but for someone getting started, the “basic” store would suffice. In addition to having a blog and forum, ArtFire also has “Guilds” for sellers. These Guilds vary in types, ranging from people in certain geographic areas, people who have similar interests, people who sell certain types of goods, and so on. To join one of these Guilds would be a great way to meet other people, learn from other sellers and let them learn from your knowledge. ShopHandmade is strictly for handmade items – those items you make yourself, not mass produced somewhere for resale. You may sell craft supplies (both new or gently used) as long as they are in good condition. I did a search for “sewing patterns” and came up with a couple, and did see some toddler shoes, which also was a pdf pattern, however because of their rules and because of the type of people shopping there, I would not put my patterns on the site. There is no fee of any type to set up your store at ShopHandmade and you get 100% of the profit when you make a sale. You simply set up your store as you choose, using your product descriptions and prices, and (because you had your pay pal address listed with the site when you registered to sell), every product sale goes directly and immediately into your pay pal account. Ebay is familiar to everyone, so opening your own store on ebay may be something you’ve been thinking about. In order to be eligible to open an eBay store you must have a PayPal account that has been verified. You must also have an eBay seller account. Even if your plans aren’t focused on the main eBay website, you’ll still need an eBay seller account to sell using an eBay store. If you haven’t already, join eBay, then ensure that a current name, address and phone number are on file at eBay and place a payment method (bank account or credit card) on file from which your eBay fees will be taken. Basic stores cost $15.95 per month and include your own storefront, the ability to add your own customized pages to the store, and discounted $0.20 per listing insertion fees for fixed-price (non-auction) items in your store. There is also the option of having a “premium” store, which costs $49.95 per month, but does have the benefit of lower listing insertion fees of $0.05 per listing. You can sell any type of handmade products, patterns, supplies or whatever it is that you want to sell. glcMall is a site for selling all of your handmade products. Their mission is for the home based craft business to be able to make a living selling their crafts online by connecting with customers worldwide. GLC Mall has no listing fees and has 4 store plans, depending on the amount of items you will be placing in your store. The “Basic” store is completely FREE of any charges – the only drawback is that you can only list up to 12 items. The “Basic Plus” store lets you list up to 100 items for a flat rate of $3.50 per month. The “Semi-Pro” store lets you list up to 250 items for a flat rate of $6.95 per month, and the “Pro” store lets you list an unlimited number of items in your store for a flat rate of $12.00 per month. Any of the flat rate fees actually sound pretty good; however I can’t imagine too many people having even 100 items to start off with, so the Basic Plus store for $3.50 per month is quite a bargain! Once again you get 100% of the sales profit, going immediately into your pay pal account. There are probably other places online that you can sell your products, but the above listing will get you started. Depending on WHAT you are selling will determine the choice of venue that would appeal to you. For example, ShopHandmade is strictly limited to handmade items, so those of us who make patterns of all types to sell would not look there to open a store. I DID see a few pdf patterns there, but I’m thinking most customers at that site are looking for products already made. Go over the list and check out each website thoroughly before making the final decision of where you want to list your products. Good luck and happy selling!! !